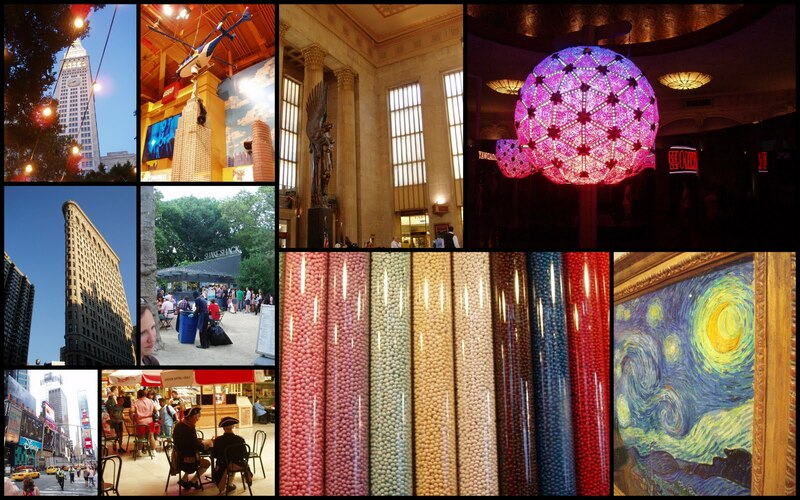 Took the train from Philly this morning (man, that Philadelphia train station is beautiful!) and arrived in New York City just a little after lunchtime. We navigated the subway to our hotel (a tiny little place with tiny little rooms — but very “efficient”), then walked a couple of blocks over to the Museum of Modern Art. Saw several very nice — and many very famous — works there, including Van Gogh’s Starry Night. Then we walked down to Times Square. Explored the Hershey Store, the M&M Store, the Toys ‘R’ Us… all the things you come to NYC for! We met my cousin for dinner at Madison Square Park’s “Shake Shack” which was really good. The line stretched forever, but moved fairly quickly. We ordered great burgers and shakes (Diana’s burger had cheese-stuffed portobello mushrooms that she said were awesome). The park is beneath the MET Life building and within site of other great sites (Flatiron building, for example). Tomorrow we’re going to go see a show! Next time you go to NYC you should check out City Maps. I use it all the time to help sort through the NYC Bar scene. Its great because I get all the info I need from parking rates to cover cost before I even leave the house. It will serve you well since you aren’t super famililar with the city and like Electronic music.. it will help focus your search on what you want.